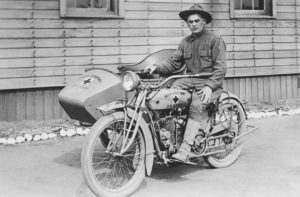 Private Henry M. Walsh of the 316th Sanitary Train poses on a motorcycle in France circa 1918. 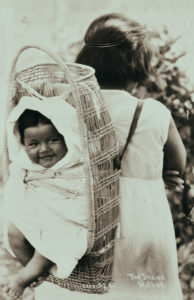 A gallery of images from our archival photograph collection that represent Native Americans from across the county. Spanning the dates between 1870 and 1950, a period of great trauma and tumult for local Native American people. Despite the adversity they faced, Native Americans still found ways to honor and continue their cultural traditions. Many photos show signs of the social fractures created by these changes: itinerant workers from the Warm Springs reservation who traveled for work, or the perpetuation of a false narrative that claimed Native Americans were a people facing extinction. Take a look at the oldest authenticated building in Lane County. It has had a colorful life between its original 1853 construction in downtown Eugene to its current location just inside the east museum gate entrance. It has recently undergone major restoration work, and is an excellent example of pioneer architecture. The jail bars came to the museum from the Lane County Forest Camp, now closed. Presumably, they originally came from the county jail building which sat on the NW Park Block at the corner of 8th and Oak Streets. The building was built in 1892 and torn down during 1959. The doors seem to be a mix of industrially produced steel parts welded together. The doors might have even been assembled at the local Eugene Iron Foundry, which would fit with the period of use for the old county jail. Learn about the ways transportation has changed over the years, and how it shaped our history. The courthouse stairs were originally installed in the two-storied Lane County Courthouse erected in 1898 at the NE park block at the corner of 8th and Oak Streets. The courthouse was torn down in 1959 to make way for the new courthouse facility and the stairway was reinstalled in the expanded portion of the then Lane County Pioneer Museum – built only a year earlier. Note the hand carved newel posts with the pineapple motif. Pineapples are a traditional symbol of friendship. They also may represent the early contact with the Hawaiian Islands during the days of the sailing ships and early European settlement. Lane County’s pursuit of the perfect building for its courthouse has been a long and colorful one. Learn about our legal history in the four different courthouses Lane County has had since 1853. Plead the fifth in the original witness chair and pose for photos on the staircase from the 1898 courthouse. Discovered during a logging operation in 1960, this tree section is carved with a message pioneer Silas Condra left over 150 years ago. See a mini recreation of a forge from the turn of the 20th century and learn about some of the items blacksmiths made.